Published: May 31, 2010 at 01:20 p.m. 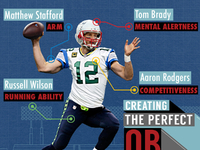 The desire to build a champion is the priority for every coach, but the task is seemingly impossible without the right quarterback. In Carolina, John Fox is hitching his title hopes -- and his job security -- on unheralded signal-caller Matt Moore. Although the fourth-year pro hasn't garnered national recognition, he endeared himself to teammates and club brass after guiding the Panthers to four wins in their final five games. 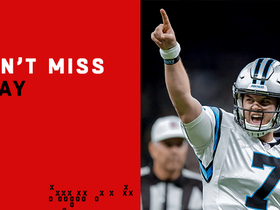 Moore, who threw for 990 yards with eight touchdowns and just one interception during the five-game span, revived an aerial attack that had sputtered for most of the season under the direction of veteran Jake Delhomme. The former Pro Bowler routinely missed open receivers and questionable decisions led to 21 turnovers (18 interceptions and three fumbles). Just as troubling, Delhomme seemingly lost his ability to connect with the team's top receiver, Steve Smith, in crucial situations. Smith, a five-time Pro Bowler, finished with only 65 catches for 982 yards, which ranked 25th in the league. Interestingly, Smith amassed 378 yards of that total in December (Smith only played in four of Moore's five starts). With Smith and Moore seemingly building chemistry, the decision to make a switch at quarterback appears sensible. In breaking down Moore's game, he's best described as an efficient passer with slightly above average arm strength and good velocity. For someone with just eight career starts, he shows surprising timing and anticipation. He's also willing to opt for high-percentage throws to keep his team in manageable situations, which makes him the ideal caretaker to direct the Panthers' blue-collar offense. 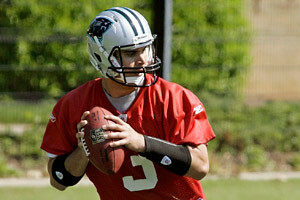 However, the Panthers will need more from the passing game to become contenders in the NFC. 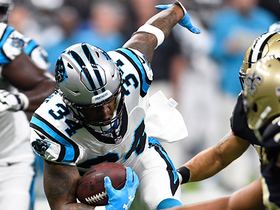 While their third-ranked rushing attack features a pair of 1,000-yard backs in DeAngelo Williams and Jonathan Stewart, the team lacks explosive weapons in the passing game outside of Smith. Muhsin Muhammad, last season's second-leading receiver, was not brought back and Dwayne Jarrett, a 2007 second-round pick, has been a major disappointment. After three seasons, Jarrett has just 33 total receptions for 388 yards and one touchdown. That's not the kind of production that the team expected from the former USC standout, and he must make a big splash in training camp to secure a starting spot. One player who could emerge as Smith's sidekick is rookie Brandon LaFell. 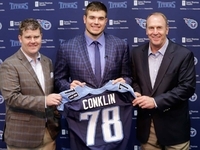 The third-round pick has been impressive in workouts and, at 6-foot-2, 211 pounds, gives Moore the big target needed to work the middle of the field. With the Panthers using the threat of their dominant running game to establish an effective play-action package, LaFell could team with Smith to provide explosive plays on the outside. 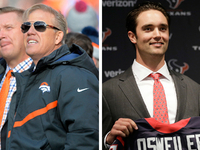 Fox has placed a greater emphasis on the passing game during offseason workouts, including spending the first three days of organized team activities last week focusing solely on the area. The extra time spent on developing chemistry between Moore and his targets could pay significant dividends. Given Moore's inexperience, the extra repetitions are needed to accelerate his development. 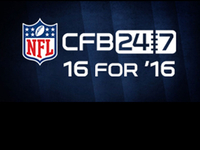 In addition, it will help young backups Jimmy Clausen, Tony Pike and Hunter Cantwell acclimate to the pro game. 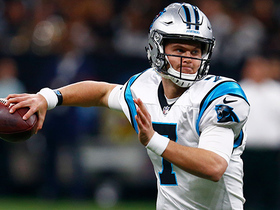 While many on the outside expect Clausen to eventually push for the job, Moore is firmly entrenched as the starter and Fox is banking on him to carry the offense. 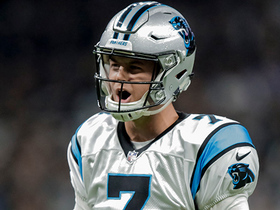 With everyone in Carolina operating under a win-or-go-home premise, the pressure is on Moore to play like a franchise quarterback in 2010.